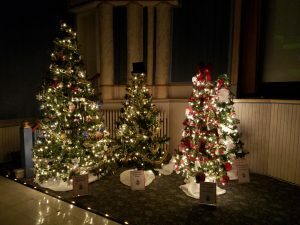 New London’s Holiday of Wonder is an annual event held the first Friday night in December. In 2018, the festivities will begin Friday night with the Reindeer Run hosted by the New London Parks & Recreation Dept. Typically, all ages are welcome to participate in this 1 mile fun run / walk. The Reindeer Run begins at 5:30 p.m. at the Ignite Practice Facility, 300 Wolf River Plaza. Participants are encouraged to wear imaginative and fun holiday decor. Participants run the parade route just prior to the start of the parade and finish downtown at Wisconsin St. where they can enjoy the parade. Due to Municipal Code 9.41 pets are not allowed in the run / walk. At 6:00 p.m. local groups, individuals and businesses join in the street parade, which starts on S. Pearl St. and disbands in the Wolf River Plaza parking lot. All are welcome to participate. Interested groups are asked to complete the parade entry form; the link can be found at the bottom of this page. Visit Santa and Mrs. Claus at Santa Land in New London’s Grand Cinema Theatre Friday, from 3:30 – 5:30 p.m. and again 6:30 – 8:30 p.m. Santa will have a special gift bag for each child.